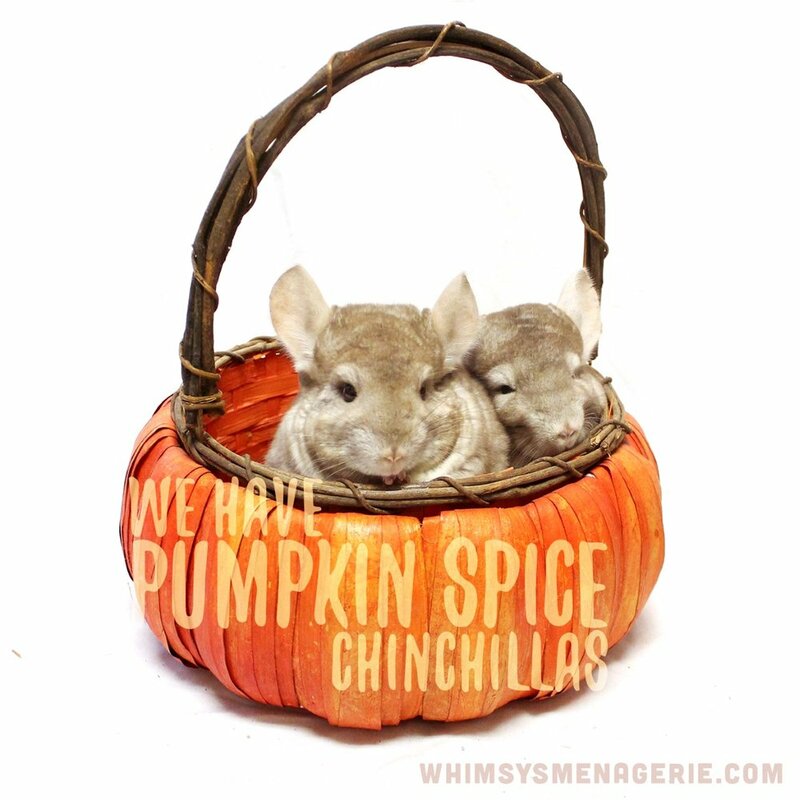 For the month of November four (4) chinchillas were surrendered and four (4) chinchillas were adopted, including the poster boys from our Pumpkin Spice Chinchillas picture. We currently have about 16 chinchillas waiting for their furever home. We’ve practically given up on trying to keep the website current with regards to the specific chinchillas available. The numbers change so often! Plus, we really hate the thought of those who are “color shopping”. We prefer instead that the chinchilla be a good fit with the family when it comes to personality, temperament and activity level. Onwards! The year 2018 has been a year of many changes. We moved to our new home. The chinchillas and webstore related “werk” got an upgrade with a building all its own. We’ve had a major mind shift from working out of the dining room to actually going to a separate, no kidding, office. (Even though the commute is only about 550 feet.) Keeping office hours seems to have made a big difference in productivity. Another change we’ve seen this year has been the sad goodbyes of the two special education teachers with whom we have worked so closely. We have spent nearly a decade as Partners in Education with the local high school where the students help us craft our chew toys, cage accessories and other supplies. This year not one, but both head instructors have retired and passed their classes on to the next generation of educators. We’re still working out kinks with scheduling, but hope to be back in full swing with our student helpers soon! In the meantime Whimsy’s clan has been busy building the necessary parts and pieces to make our goodies. Ziggy, Whimsy’s son with autism, is happy to take up the slack where our student helpers would normally fill the store. He even has his very own office and assembly room! As we work to thin that area it is providing us with plenty of firewood with which to heat the rescue building. We’re still struggling with the HVAC system and spent nearly $1000 over the summer just to get the air conditioning working for the chinchillas. Once again the system has failed us and we’ve come to grips with the fact that we should stop paying outrageous prices for temporary patches. The system is original to the building and is 18 years old. There is a woodstove in the workshop that pumps out enough heat to keep the building a cozy 54-65 degrees. The chins are loving it! Having the woodstove will give us several months to save up for a new heat/air system before we need it again for cooling. So as I look out my office window and admire the 12+ inches of snow, I think back over the year and consider how far we’ve come. November 1st marked the 10 year anniversary of Whimsy’s Menagerie. It’s been an unexpectedly amazing life path that no one could have possibly predicted. Operating a home based rescue has been a wild ride, not to mention an odd lifestyle. Many times it has been a rapidly shifting existence full of frustration and grief, success and joy. Even still, I have no regrets. 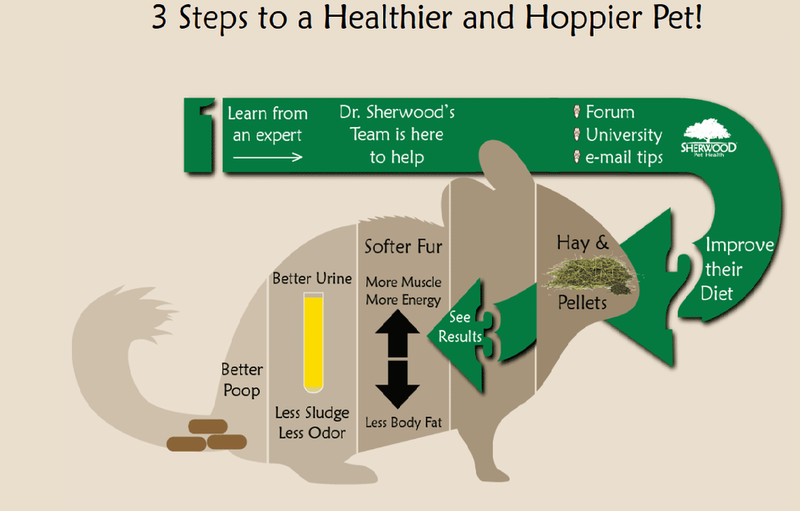 So, many thanks to you, my chinchilla friends, for your support and good favor. My prayer is that I may be good enough to earn and keep it. Merry Christmas, Happy Holidays and have a blessed and happy New Year. 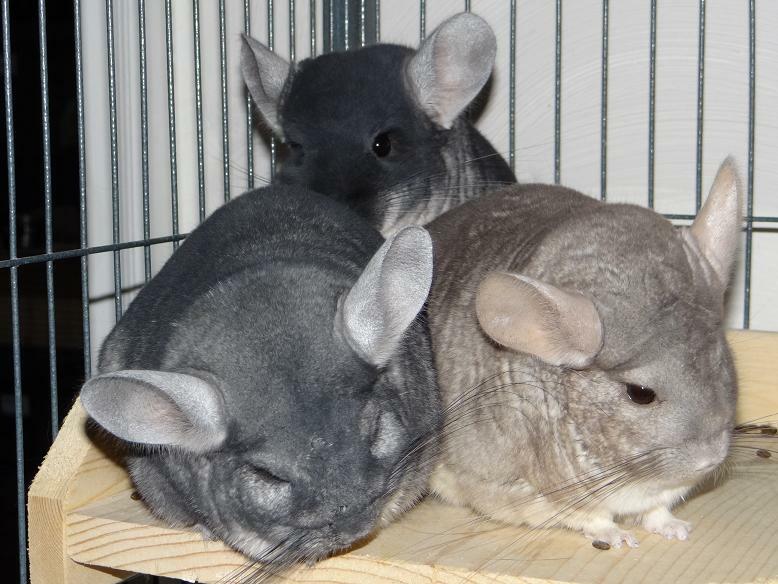 For the month of April we had four (4) chinchillas surrendered and two (2) chinchillas were adopted. 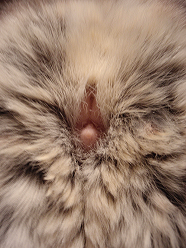 Our numbers of chinchillas are much more manageable now and our upcoming move of them should be relatively easy. We had hoped to have everyone settled in before the heat of summer, but it looks like that’s just not going to happen. We assumed that by hiring pros we could get the necessary work to the new building done quickly and efficiently. That has proven to be a radically unrealistic idea as we are at the mercy of every one of those individuals' schedules. So far we’ve had the framing to the new chinchilla room done. 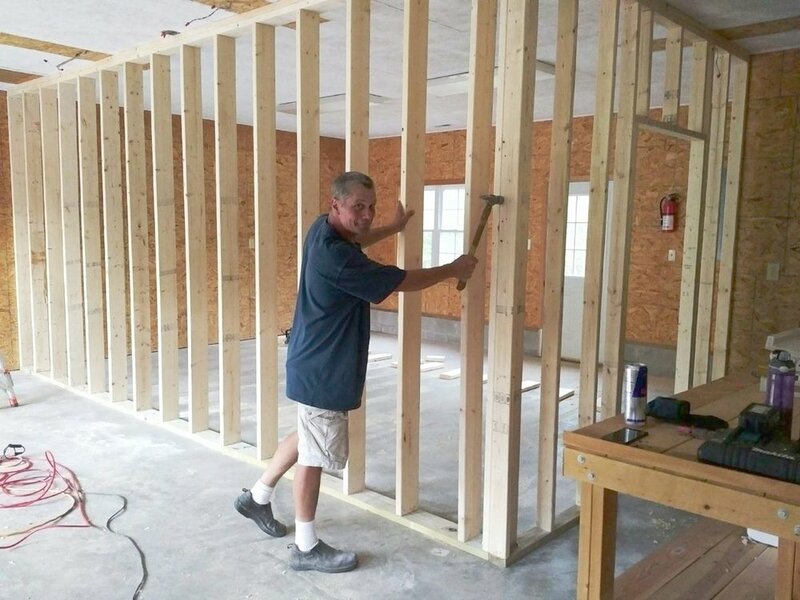 Ed from Olde Oak Construction was especially sensitive to our timeline and worked us in to his schedule. His work was outstanding and very reasonable. AND, he cleaned up after himself! We hope to utilize Ed for many more future growth projects. We’ve also got the electrical moved, new lines run and powered up. The extra thick insulation is in place for added sound dampening and heat barrier between the rescue room and workshop. The drywall is up. Doors are in place. Sounds good, right? Well, now comes the hard part. The air conditioning in the building completely died and it just so happened during the electrical and drywall phase. So the drywall mud couldn’t dry and the construction guys were absolutely miserable. Now we’re fighting with the home warranty company about repair to the HVAC system. Obviously we can’t move the chinchillas in until that is fixed! In the meantime, we are slowly painting the offices as we can squeeze in time for a day trip and hauling in lots and lots of files. We still need to finish the drywall. Our wall man seems to have fallen off the face of the earth. (Karma baby, Karma) We need to finish the trim, prime and paint the rescue room. Needless to say, with all the road blocks we have no planned date for our official move. We’re still operating surrenders, adoptions and websales (mostly) as usual. We appreciate a little extra patience as we juggle the timing of everything. Here is a panorama inside view of the rescue room. The wall isn't "really" curved, it's just the camera angle. This shows our progress as of today. Getting closer!